Last week, Lloyd, our Media and Communications Manager, was interviewed by Paul Hammond on UCB 1. I have recently attended a training course on how to deal with the press, which was filled with great practical tips. Following the training, I wrote a press release and sent it to various news outlets, both local and national. The press release detailed our experience of increased levels donations this Harvest for our Brighton Food Bank, and that we are on course to beat our Harvest donation record. The story was featured The Argus, our local newspaper, and will be used in the Diocese of Chichester quarterly magazine, Faith in Sussex. I found this news exciting. However, I was extremely pleased when I was contacted by the national Christian radio station UCB 1. I was asked if I could share about the work of our food bank and the general issues around running a food bank. The interview was broadcasted on Paul Hammond’s morning show, Talking Point. He started off the interview by asking if we see much, as the children’s Harvest festival song goes, ‘cauliflowers fluffy and cabbages green’! I told him that it’s actually quite a rare thing these days to see fresh fruit and vegetables donated in schools, although we do occasionally see the odd marrows come through! As the interview went on I was able to share how our food bank worked, that it is a referral based, crisis agency. I explained how we make our clients feel welcome, as coming to us can be quite daunting, and how they are able to select the food that they like from our shelves, as opposed to being handed a pre-prepared food parcel. I was then able to share about the amazing 8 tonnes of donations that we have received over this Harvest period, but how that would only help around 20% of the clients that we see over the course of the year, and therefore we need donations all year round. We finished the interview talking about Christmas. I spoke about the items that are most needed which people could donate over the festive period. We joked about how open packets of biscuits are not helpful as we can’t give them out, but how treats are vital to help the clients feel normal, and to help them celebrate Christmas! So, all in all, it was a great interview. 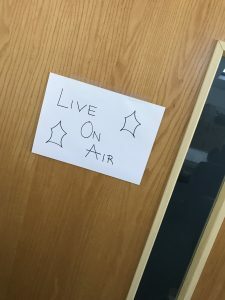 It’s the first live broadcast I have ever done so it was a bit daunting, however I can’t wait to be on the radio again, or even television! As supporters you know of and love the stuff that we do, however, raising our profile in the media will enable so many more people to hear about the amazing work that we do in our city.